We’re celebrating Meatless Mondays with balanced, delicious meal plans. We hope you’ll join us — whether you’re vegetarian all the time or just here and there. Today: Two dishes that feel like a warm hug. It’s Monday night, it’s cold outside, the news in the paper is frightening, and you’re about to curl into a ball and make a nest in your bed. But before you do that, make a dinner that feels like a long hug from someone you love and haven’t seen in too long. Maybe you won’t make these recipes for yourself every night, but just knowing that food like this exists will make you a little happier. Preheat the oven to 350° F and get out two saucepans — one heavy, one small. In the heavy one, cook peeled and cubed butternut squash. In the small one, make the onion jam. While the squash cooks, get the blondies ready to bake. Toast the nuts in the oven for 10 to 15 minutes until they’re a deep golden brown. Meanwhile, prepare a 9- x 13-inch pan with foil and mix together the batter. When the nuts are ready, chop them roughly and fold them into the batter along with a generous amount of chocolate chunks. Turn the mixture into the prepared pan and bake for 22 to 25 minutes. Now that the blondies are in the oven, return to the stove. When the squash is tender and the onion jam is spreadable, mix the jam into the squash, stirring and mashing gently. Cut a big, rustic loaf of bread in half along its equator and toast the bottom half in the hot oven. 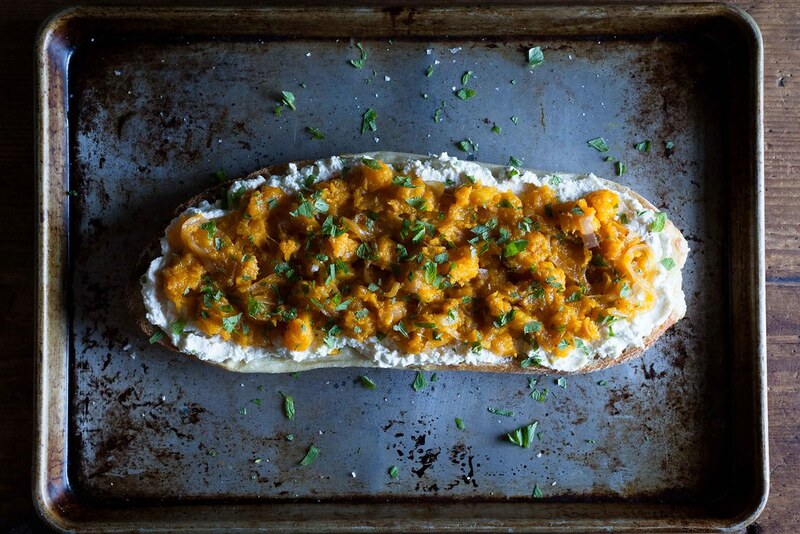 Spread it with a thick layer of ricotta, then top with the squash-onion mixture, flaky salt, olive oil, and fresh herbs. 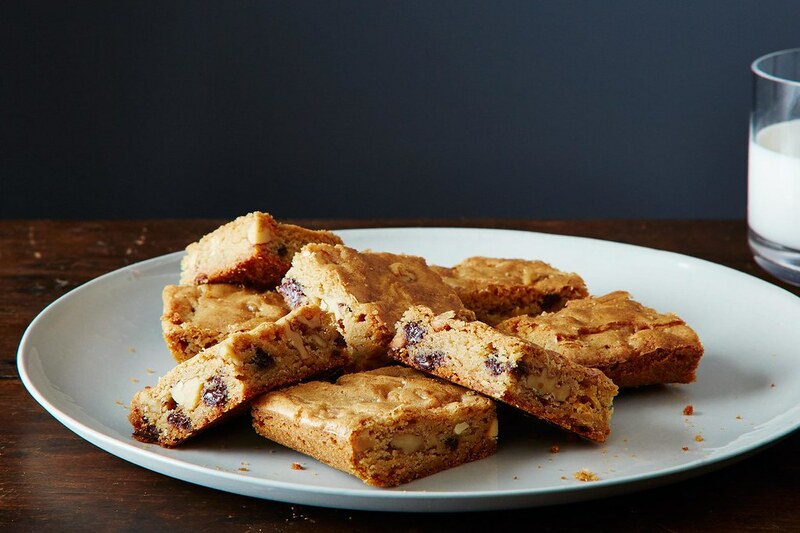 As you eat dinner, let the blondies cool on a wire rack. When you’re ready for dessert, cut them into 2-inch squares (or bigger) and pour yourself a glass of milk. We’re assuming you have these things in your kitchen: olive oil, dried chili flakes, kosher salt, apple cider vinegar, maple syrup, all-purpose flour, baking powder, butter, light brown sugar, eggs, and vanilla extract. If not, stock up!